The best Thanksgiving movie of all time. Granted there are not that many of them, but of the select few, this is without a doubt the one most synonymous with Turkey Day. Released the week of Thanksgiving in 1987, during the prime of John Hughes’ film career, this is one of his best films. It starts off with a lot of laughs as Steve Martin tries to get a cab in New York City so he can fly home to Chicago to spend the holiday with his family. He loses a taxi to Kevin Bacon in a great cameo role and then everything goes wrong as he encounters John Candy playing a lovable loser who’s job is a shower curtain ring salesman. This really captures the manic and often ridiculous aspects of trying to travel during the holiday season very well. Both Martin and Candy give great performances and Planes, Trains and Automobiles is a rich and hilarious comedy loaded with a lot of great small moments. It’s the kind of movie that no matter how many times you watch it, you will always laugh and can often revisit and find something new to enjoy. 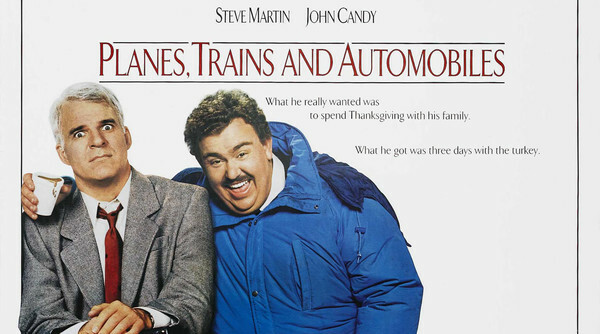 Planes, Trains and Automobiles is currently streaming on Netflix. Check out this video below to see some of the details you may have missed from this comedy classic.